Hiking becomes much more difficult in winter when the trails are covered with the snow – but not necessarily less enjoyable! To safely and comfortably execute hiking trips in winter, you might need additional equipment such as crampons, snowshoes, gaiters and an ice axe. If you are hiking on trails covered with (slippery) frozen snow or ice, crampons come in very handy as they provide you with the necessary traction and thus minimize the chance of falls and slips. Be aware that they are always used together with an ice axe as you will need it to arrest a fall – you never break with the crampons themselves because their points might stick so deep into the snow/ice that you will fall backwards. It is also recommended to use gaiters when you are hiking with crampons on. Gaiters prevent snow from entering your boots and protect your hiking pants against the crampons, since their teeth can easily tear the material of pants. 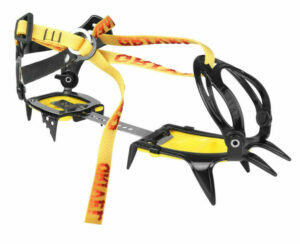 There are three different types of crampons; C1 (Strap-On Bindings), C2 (Hybrid Bindings) and C3 (Step-In Bindings). The higher the number, the more rigid the crampon. Very rigid crampons (C3) allow you to ascend very steep (vertical) slopes but do require technical footwear. Flexible crampons (C1), on the other hand, are primarily designed for hiking and mountaineering on flat and semi-steep terrain, glacier travel and similar. As they use strap-on bindings, they can be used with any hiking boots as long as they don’t have too flexible soles (like summer hiking boots). Here we reviewed the best crampons (C1) to make your buying decision easier. The products reviewed here are not suitable for ascending super-steep slopes or ice climbing but they do meet the requirements for hiking and mountaineering on semi-steep terrain covered with ice or slippery snow. 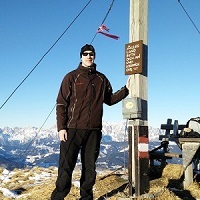 All products listed in this review are compatible with any sort of hiking boots. To learn more about how to use crampons, check out our article How to use winter hiking gear. If you are also planning to hike on terrain covered with soft and deep snow, check out our review of the Best Snowshoes for Hiking where we also offer a more detailed explanation of the difference between snowshoes and crampons. 1. 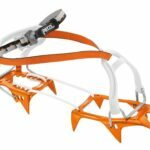 Buying Hill Walking Crampons – What is important? 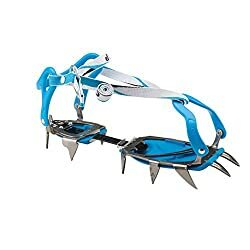 Crampons are made of steel, stainless steel or aluminum. Those made of steel are more durable than aluminum crampons but also heavier. 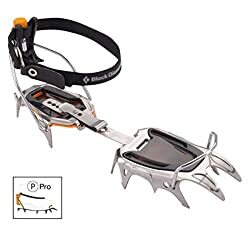 They are typically used for hiking and mountaineering while aluminum crampons are mainly used for alpine climbing which requires very light equipment. Stainless steel crampons offer enhanced corrosion resistance as well as other benefits of steel crampons. Anti-balling plates prevent snow from balling up under the crampons as too much snow can cause them to lose traction. Anti-balling plates are usually made of composite materials. The points provide you with traction; most hill walking crampons have 10 or 12 points. 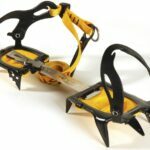 The forward-facing points on hill walking (C1) crampons are positioned horizontally so that they allow comfortable walking. 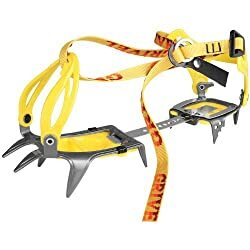 Reversely, climbing crampons are usually equipped with vertically positioned front points so that they provide good traction while climbing vertically. C1 crampons are flexible and thus comfortable to walk with. Climbing crampons are stiffer because they need to hold the weight of the climber on steep slopes when traction is only provided by the front-facing points. 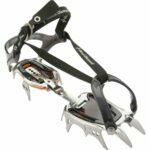 Learn more about different types of crampons in this post from Ellis Brigham Mountain Sports. Weight (pair) 1 lb. 13 oz. 1 lb. 13 oz. 1 lb. 14 oz. 13 oz. 2 lbs. 1 oz. The Grivel G10 New Classic are a hill-walking version of the highly popular Grivel G-12 crampons (hybrid bindings). As they are light and flexible, they are perfect for hikers who need a reliable product that can be used with ordinary hiking boots. They are made of Chromoly steel which has an excellent strength-to-weight ratio and offers enhanced strength in comparison to ordinary steel. The Grivel G10 New Classic are equipped with 10 points which provide good traction on frosted trails as well as on semi-steep slopes. The points are well-positioned not only for walking but also for ascending slopes. They come with anti-balling plates, thus decreasing the chance of falls and slips. The Grivel G10 New Classic are perfect for mountaineers and hikers who want easy-to-use equipment for their winter adventures. The Black Diamond Contact crampons are among the lightest products in this review. They are made of stainless steel and therefore offer great durability and good protection against corrosion. 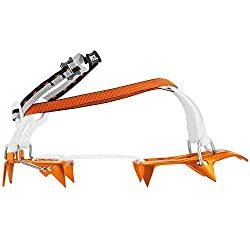 These strap-on flexible crampons are perfect for winter mountaineering as well as for hiking on moderate terrain; they are equipped with 10 points which provide great traction while not impacting comfort when walking on flat terrain. They are also equipped with anti-balling plates. The Black Diamond Contact come in two different models; strap and clip. If you are planning to use them with ordinary hiking boots, you should go for the strap model. They are a little stiffer than the Grivel G10 New Classic mentioned above and therefore they offer better performance on steep terrain. We recommend them to hikers and mountaineers who want lightweight product for semi-steep to steep terrain. The Black Diamond Serac crampons differ from the products listed above by having 12 points. Therefore, they are also slightly heavier. However, the 12 points come in handy when hiking on steep terrain as they provide good traction and stability. The Black Diamond Serac come in three different versions – strap (strap-on bindings), clip (step-in bindings) and pro (hybrid bindings). The strap-on model is designed for use with regular hiking boots, while the other two models are designed for technical boots. All three models come with anti-balling plates which efficiently prevent the snow from balling up under them. They are made of stainless steel for enhanced corrosion resistance. They are best for those who want strap-on crampons for hiking and mountaineering on relatively steep slopes. 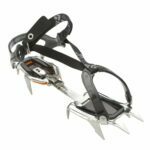 The Petzl Leopard FL crampons differ from other products in this review by being made of aluminum – which is more common among alpine climbing crampons. However, due to the aluminum construction they are super light. They weigh merely 360 grams (pair). Therefore, the Petzl Leopard FL are best for hikers and mountaineers who often do demanding trips where having lightweight equipment is a priority. They are equipped with 10 points and use strap-on bindings. Thus, they can be easily used with any hiking boots. They also use the Cord-Tec flexible linking system which reduces their volume when packed (bag for storing is included). The Petzl Leopard FL have been introduced recently and have a big potential to become very popular among hikers, mountaineers and other outdoor enthusiasts. Durability might be an issue if used on rocks etc. The Camp Stalker crampons are very popular among hikers and mountaineers. They are a little heavier (948 grams) than the other products in this review but on the other hand they are also very sturdy. They are made of Chromoly steel and equipped with 12 robust points for good traction. They also feature Vibram anti-balling plates, durable nylon straps and a thermoplastic heel. Additionally, they have CC4U wear indicators on the side points which show when it is time for replacement. They come with a carrying case so that you can easily transport them in a backpack. The Camp Stalker are perfect for recreational hikers who need an easy-to-use tool for their winter adventures. Can you use crampons with hiking boots? 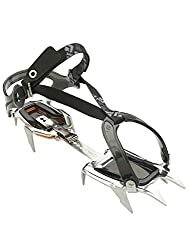 While C1 (Strap-On Bindings) crampons can be used with any hiking boots, C2 (Hybrid Bindings) and C3 (Step-In Bindings) crampons require technical boots. 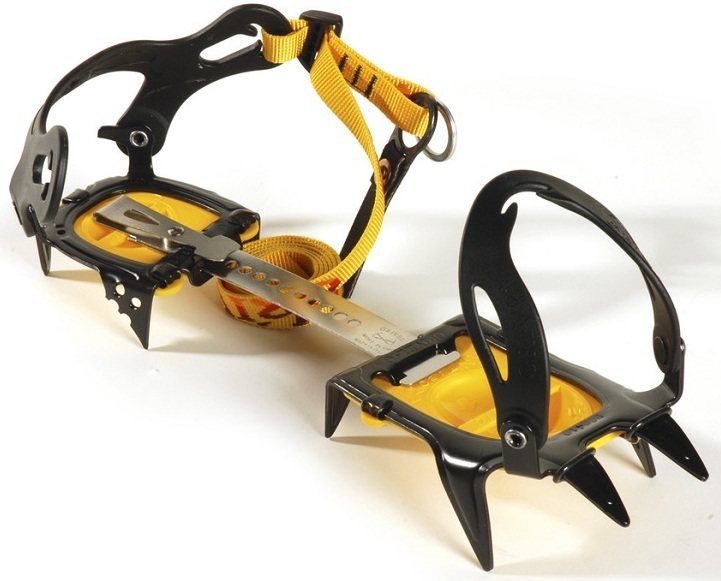 C2 (Hybrid Bindings) crampons require boots with a stiff sole and a heel groove or welt to hold the heel lever while C3 (Step-In Bindings) crampons require boots with a stiff sole, a heel groove and a toe groove. 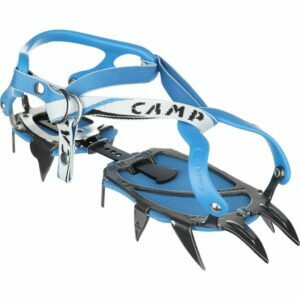 Do crampons fit all boots? C1 (Strap-On Bindings) crampons that are listed above fit all boots. However, for best fit it is recommended to use them with boots that have relatively stiff soles. 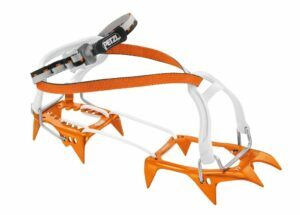 Automatic crampons have Step-In Bindings (C3) and require technical boots with a stiff sole, a heel groove and a toe groove.